Since you can’t predict the future, you have to rely on your data. The Oracle at Delphi was the chief priestess at the Delphic Temple of Apollo who, nine times a year, made cryptic prophesies answering questions regarding future events. She was consulted before many major undertakings by people from around the ancient world despite the fact that her prophecies could be vague and open to interpretation. In 550 BC while considering war with Persia, King Croesus of Lydia consulted the oracle. “If you attack you will destroy a great kingdom” he was told. Unfortunately, the kingdom she was referring to was his own, and he lost everything after a crushing defeat.When it comes to business questions of today people turn to their data, to algorithms, and to the employees who work with their data. Predictive analytics is increasingly more alluring: the more data we produce, the more powerful computers become. Forrester Research has said that business analytics is the fastest growing category of global IT software expenditures. Surely then, with all this money spent on powerful computing, we could mine a mountain of data to tell us how to move forward. Since you can't predict the future, you have to rely on your data. While data informed decision making is less esoterically vague than the days of the oracle, we still can’t predict the future. It’s your responsibility to balance your own past experiences with data to create the way forward. 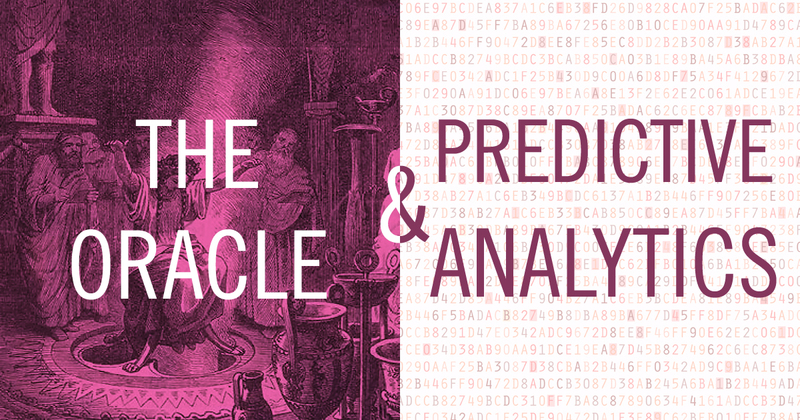 Predictive analytics is not, nor will it ever be, the only ingredient needed to determine your course of action. It takes good data and good people to move forward.